I was so delighted when the girls at piCture pOlish emailed me and asked me to review their upcoming Opulence Range. I'm not one to really hang out much on Facebook, in fact I don't even have a personal profile page, so I wasn't really in the loop about the shades until I got their email. 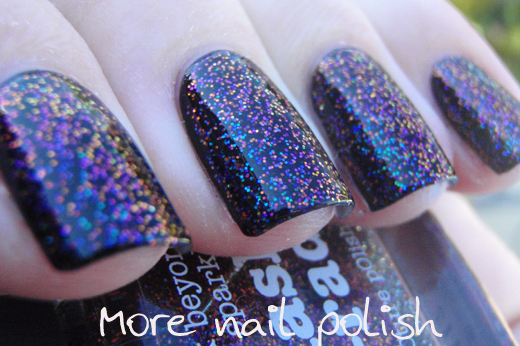 I quickly skedaddled myself over to Facebook to check out the shades and instantly got grabby hands. 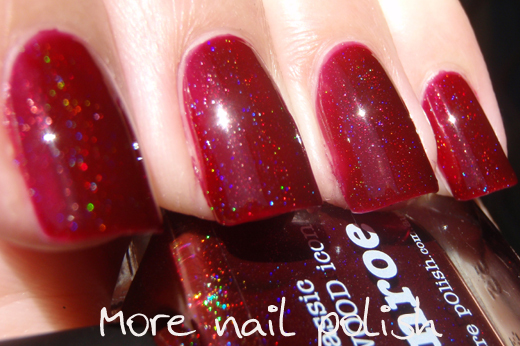 Monroe is a blood red jelly polish with fine holographic particles scattered throughout. I don't own any dark red jelly polishes like this so I think it's just the most lovely shade, and I love that it has the secret holo glow to make it more interesting. The holo effect in this is subtle, but definitely there. What I love is that it doesn't dilute or 'silver-out' the blood red shade and make it pink. Anyone that has attempted to make a red holo polish using spectraflair will know exactly what I mean - they always end up pink. These photos of Monroe are taken in full sun and shows Munroe at three thin layers. 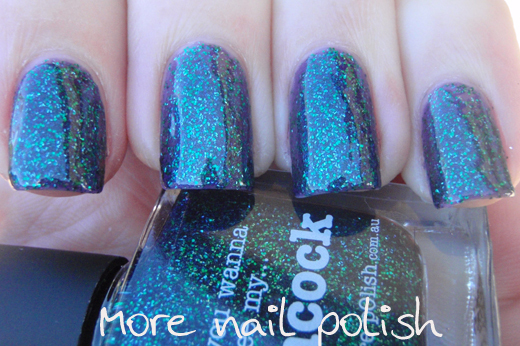 Peacock has emerald green hex glitter and silver rectangles all floating in a purple jelly base. Looking at the bottle it just looks emerald green, it was only when I put it on my nail that I realized it was in a purple jelly base. 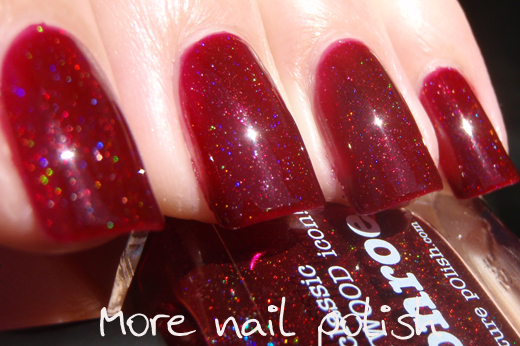 The glitter is quite dense and it is easy to get it opaque on it's own. This is three coats of peacock topped with Ulta3 non chip and Seche Vite. It did need two layers of top coat because, like 99% of fine glitter polishes (eg Nubar sparkles and Tony Moly Galaxy's) they dry to a rough finish. Top coat really makes the glitter shine. My photos are taken in the shade, because I find I get the best photos of glitter when there isn't all that light bouncing of the glitter particles. But because of that, the green glitter in this polish looks washed out from the light reflection. These photos make the glitter look teal coloured, but it really is emerald green, which you can see more in the top half of this picture. This next photo is photo-shopped! I did this to show you what the green glitters actually look like. See they are emerald, not aqua! Next I tried layering peacock over a dark purple. I chose piCture pOlish Aphrodisiac - which is a dark shimmery purple as the base. One coat of Aphrodisiac and one coat of Peacock. With the exception of the density of the glitter, it looks almost identical. 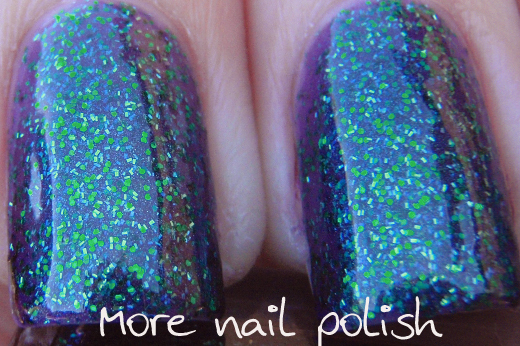 Love this combo of green glitter with purple polish. Here is a macro of peacock over aphrodisiac. 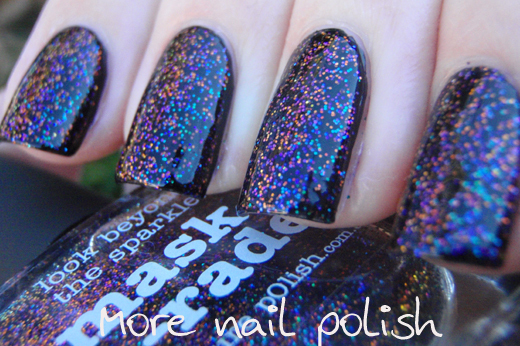 Mask-a-rade is a clear base with multi chromatic glitter hexes. 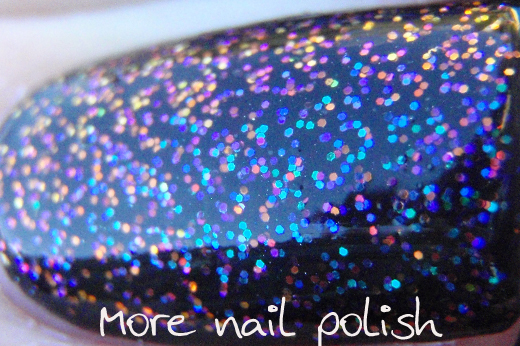 In fact it appears to be the identical multi chromatic glitters that are in the three Elytra polishes, but this polish has all three colours in the one bottle together!! These photos are two coats of mask-a-rade over black creme, with a single coat of Seche Vite topcoat. 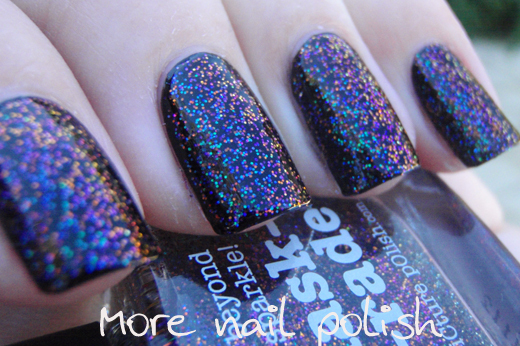 So not only is this a multi coloured glitter, it also shifts to a multitude of colours too. 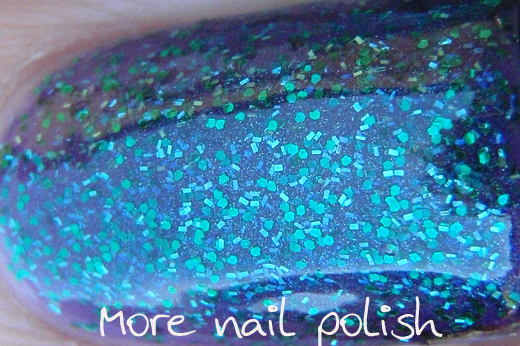 If you can't decided which Elytra polish to get, then it's a no brainer, get Picture Polish's mask-a-rade. Scrangie recently reviewed this collection and commented about them having a difficult formula. Here's my comments on the formula. Monroe - slightly on the thick side, but I didn't have any issues with it. The brush is soft and smooth and the polish just flowed on for me, although I did need three coats for full colour coverage. 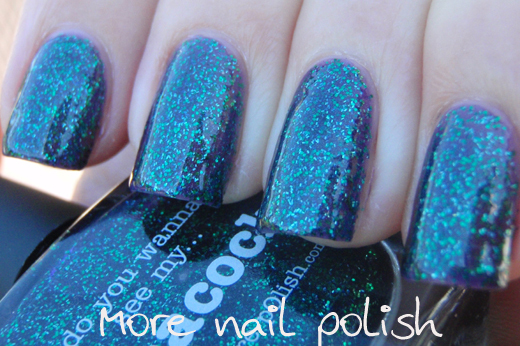 Peacock - this one is a little thick, but it actually reminds me of the same consistency of polish when I have frankened a glitter polish with lots of fine glitter. 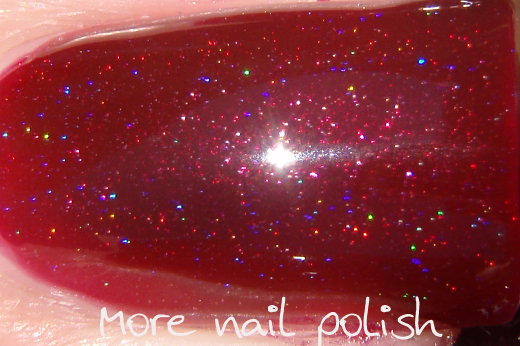 Because I have made lots of polishes like that, I was 100% ok with the formula. 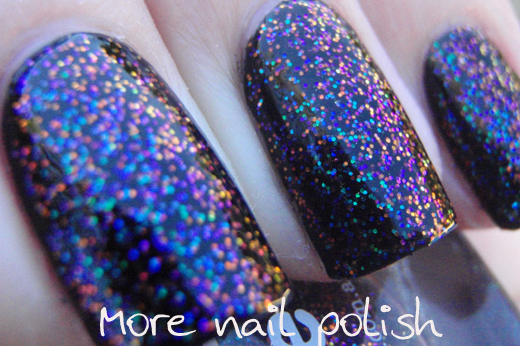 I just think the thickness is a by-product of a polish full of fine glitter. 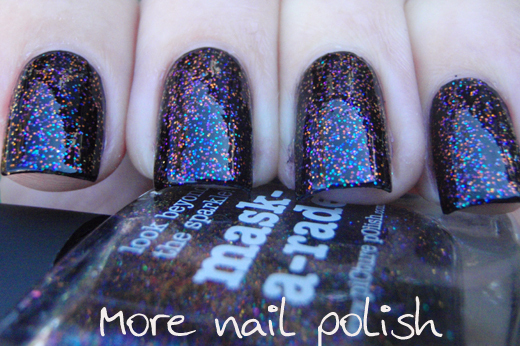 Mask-a-rade - the formula was perfect, exactly like the Elytra polishes. The Opulence range is available now on the Picture Polish website and they cost $13.50AUD a bottle. Yeah, yeah, I know some of the ladies overseas are going to think that $13.50 is an expensive polish (even Scrangie commented about expecting better formula at $13.50 a bottle). But what you have to remember is that nail polish is expensive here in Australia. These polishes are cheaper than Revlon ($14.95), OPI ($19.95), Orly ($15.95) and don't mention Chanel ($39). We pretty much only have one brand that is less than $3, which is Ulta3. 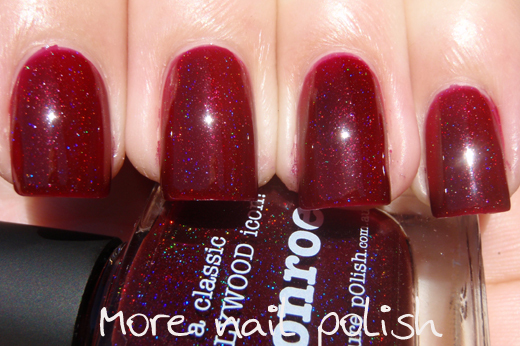 Generally any polish under $10 is considered cheap, but between $10-$15 is a fairly standard price! Plus it's Australian made. That's a huge thing for me as an Aussie. There isn't a lot of stuff that is manufactured in Australia these days, it's all pretty much made in China. I know that's not really important for international consumers, but for me, that is a big selling point and very much worth any extra dollars! Damn, I think I'm gunna have to get Peacock. It's super pretty, I can't help but love green glitter! I've just received my first picture polish yesterday and I'm in love! The shade is called denim and it's oh-so-amazing! Yes, Denim is such a gorgeous shade!! I've worn it under a Lynnderella polish, but not yet on it's own. I must do that!! Yay for Aussie made polish. Really like the look of mask-a-rade, so pretty. They all lokk great on you & I love how Peacock looks layered over the purple - definitely have to try this out! Aw, Aussie made is important to me! I have a huge Ozotic collection that I love so much! I'm constantly amazed with how much Revlon goes for outside the US. If I were rich, I'd send some to all you gals because I think the markup is nuts! I want Peacock and Mask-a-rade! They're amazing.